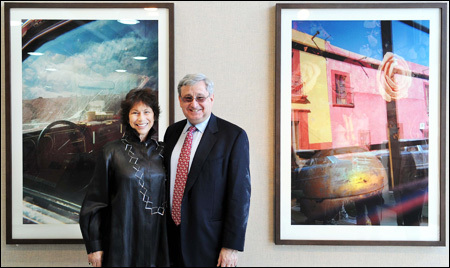 Artist Janet Sternburg, left, poses with her husband Steven Lavine, the president of California Institute of Arts, next to her photo works at the Art & Technology Center at the Seoul Institute of Arts in Ansan, south of Seoul. While both professional and amateur photographers produce memorable photos with expensive and high-quality cameras, writer and photographer Janet Sternburg found true beauty with nothing but her disposable cameras. `` When I developed (a) picture, it was no big deal, it was just a picture. But little by little I realized that I was seeing the world differently and that was when I realized that the disposable camera was not the last choice, (but) it was actually my friend,'' she told The Korea Times during an interview at the Seoul Institute of the Arts, Ansan, south of Seoul, last Friday. ``In the digital world, people just click, click, click. For me, when I use the camera, I wait and I almost always get what I want,'' she added. Her works are a bit different from other photographs, which usually capture a single moment or subject. By using a disposable camera that lacks highly efficient functions and by working in front of windows and mirrors, Sternburg was able to capture subjects on the other side of the window and the reflection of the window at the same time, capturing two different worlds in one photograph. With the help of video artist Ed Purver, she managed to bring her colorful works as prints, projections and choreographed on multiple monitors. It was 12 years ago when she first discovered this unique art form. ``A happy accident,'' she called it. ``I had finished working on a memoir called `Phantom Limb.' We have a home in a small village in Mexico and I went there and went for a walk. I looked at a store window and suddenly, I saw beauty in front of me,'' she said. There, Sternburg bought a disposable camera and captured the moment. The camera may not have had fancy features or functions, but for the artist, it was more than enough to bring out the unusual beauty she'd found unexpectedly. ``One of the great things about using a little harmless camera like a disposable (is that) nobody thinks you are trying to take a picture that is serious, they think you are a tourist. You cannot do professional things (to the photos) and because (we) cannot do that, that limitation is a great gift. The disposable camera would let me see all the layers of time and space that are present in a single moment,'' she said. Sternburg is a writer ― a poet, memoirist, playwright ― and filmmaker and a photographer, often praised as a ``renaissance woman'' for the breadth and depth of her vision. Having published one of her best works, ``Phantom Limb: A Memoir'' in 2002 and ``The Writer on Her Work'' in 1992, she has explored various mediums, and when asked what she considered herself, she shrugged and said that narrowing it down was never a good thing. ``At first I thought, `Am I a writer? Am I a photographer? Which comes first? I thought about it because in this world people like you to be one thing or another, it is easier that way. But now I say that my writing and photography are having a conversation: wherever my work is, my books are there too. Saying that this is what I do is not as important as developing a vision a way of seeing the world. You have to think about how you see the world,'' Sternburg advised. When finally asked how many disposable cameras she'd thrown away, Sternburg laughed and reminisced. ``Hundreds! I think they may be more expensive altogether than buying just one (digital camera),'' she said. Sternburg's Fertile Confusion will continue through May 18 at the ATEC of Seoul Institute of Arts. For more information, visit www.seoularts.ac.kr/fertileconfusion.